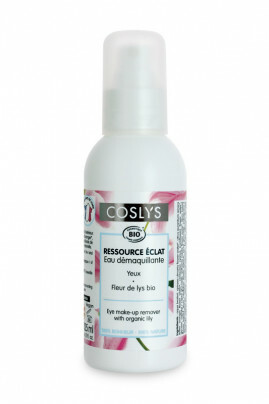 COSLYS Organic Lily Eye Makeup Remover eliminates gently all trace of makeup. Smooth and non-greasy, its formula rich in organic cornflower water and lily extract protects and soothes the sensitive eye contour area. Soak two cotton pads with COSLYS Organic Lily Eye makeup remover. Put the cotton pads on your closed eyelids to dissolve eyeshadows and mascara. Gently swipe them from the inner corner going outwards without rubbing. Renew until complete elimination of makeup. Aqua (water), spiraea ulmaria flower extract* (organic heartsease floral water), citrus aurantium amara (bitter orange) flower water* (organic orange blossom water), centaurea cyanus (cornflower) flower water*, glycerin (vegetal glycerin), caprylyl / capryl glucoside (non ionic surfactant from coconut), anthemis nobilis flower water* (camomile floral water), lilium hybrid flower extract (lily extract), lilium candidum flower extract* (organic lily extract), lauryl glucoside (non ionic surfactant from coconut and glucose), polyglyceryl-2 dipolyhydroxystearate (natural emulsifier), sodium cocoamphoacetate (amphoteric surfactant from coconut), borago officinalis (borage) seed oil*, parfum (100% natural fragrance), potassium sorbate (conservative), sodium benzoate (conservative), citric acid (pH regulator), sodium cocoyl glutamate (anionic surfactant from coconut), tocopherol (natural vitamin E), glycine soja (soybean) oil (non OGM soybean extract), limonene, linalool (components naturally present in the fragrance).